Gullegem, Belgium, 8th March, 2018 – LVD Company nv today announced it has been awarded an order from Japanese technology company, Kawasaki Heavy Industries (KHI), via its sales agent ITOCHU MACHINE-TECHNOS CORPORATION, for its unique Synchro-Form adaptive bending technology for large-profile bending. Synchro-Form was named the most innovative new metal forming product at EuroBLECH, the world’s largest sheet metalworking technology exhibition. The Kawasaki Heavy Industries (KHI) order is for a custom-built, 1000-ton class of Synchro-Form press brake equipped with special tooling to produce large panels for the fuselages of commercial aircraft. Forming such XXL parts to a desired contour is a challenging task and one that will be significantly simplified with Synchro-Form, which maintains angular consistency and the required geometric profile and enables an in-process automatic quality control when handling, positioning and bending large parts with multiple bends. Kawasaki Heavy Industries (KHI) in Japan is a key production partner for the production of the Boeing 777X, the successor to Boeing’s popular 777 aircraft. The 777X will be the largest and most efficient twin-engine jet in the world, unmatched in every aspect of performance. LVD’s Synchro-Form press brake meets the tight tolerance requirements demanded of the Kawasaki Heavy Industries (KHI) application and the need for complete automation. The order was awarded to LVD after several bending trials and strict accuracy measurements were satisfied. 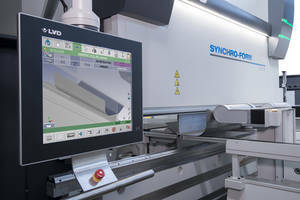 The Synchro-Form press brake will be manufactured at LVD’s world-class production facility at its headquarters in Belgium. Kawasaki Heavy Industries (KHI) engages in the manufacture of transportation equipment and industrial goods. It operates through the following segments: ship and offshore products, environmental control and energy plant engineering, machinery and robotics, rolling stock including Shinkansen and New York subway cars, leisure products, such as the worldwide known Kawasaki motorcycles, and others. The aerospace division is active in products ranging from aircraft to satellites. KHI is a long-time partner in the international joint development and production programs in commercial aviation. Jointly with US-based Boeing, the group manufactures and develops components for the Boeing 767, 777, 787 and now 777X. KHI has more than 35,000 employees spread over about 100 group companies in Japan and worldwide. ITOCHU MACHINE-TECHNOS CORPORATION is a technology-oriented machinery trading company providing a total solution for machine tools, industrial machinery and the food and pharma machinery markets worldwide. The company handles sales of various machine tools for domestic sales, export and import, and also provides engineering services of whole systems including peripheral components.